Biology is, as the very name tells us, “the science of life.” Nothing can be more important to us, since we are examples of life. We must picture life, since we have no direct evidence to the contrary, as existing only on Earth, and that just barely, by the merest hair. Does this show, then, that life is extremely unimportant in the universe as a whole? No! Because, of all the subtances we know, only living things seem to display any sign of “consciousness,” and this, surely, is a unique property. Such uniqueness of behavior produces a quality of life that far more than makes up for the insignificance of its quantity and its terrifying fragility. As far as we know, we are the only beings in the entire vast universe who turn questioning eyes on stars, on atoms, on ourselves, and seek answers. And it is characteristic that we always move in advance of our findings, doing so in the form of speculation. Science fiction is that branch of literature which is specifically devoted to such speculation, and where can the speculation assume more fascinating guises than in the “study of life” itself, that most amazing and most nearly impenetrable aspect of the universe. 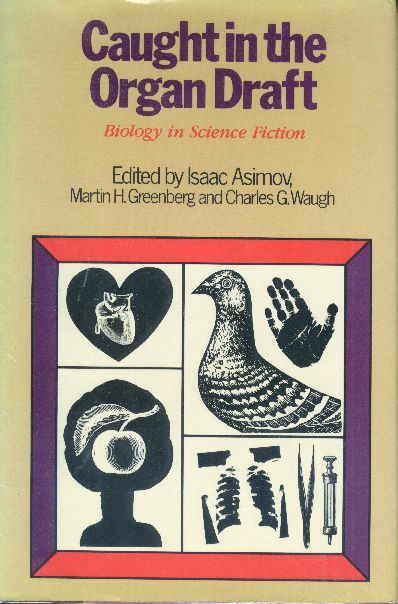 I must admit to not being able to get terribly enthusiastic about this anthology of science fiction with biological themes, despite the fact that it has Ray Bradbury’s “The Sound of Thunder” and the title story by Robert Silverberg. In part it’s because of some incredibly weak stories it includes, such as A. Hyatt Verrill’s “The Exterminator.” Nor am I terribly fond of the old and somewhat overwrought “Alien Earth” by Edmond Hamilton, although it does have some interesting aspects. Fredric Brown’s “Keep Out” doesn’t do anything for me; Poul Anderson’s “Tomorrow’s Children” is too much in the post-WWII Nuclear War is Bad™ vein, and so on. It isn’t really a bad anthology (nothing with “The Sound of Thunder” in it can be really bad), but I’d be just as happy without it. The volume also has some endnotes contributed by Asimov, discussing some of the implications of the stories’ biology, but they frankly add little to the book. This book, by the way, is a companion to the earlier Hallucination Orbit.